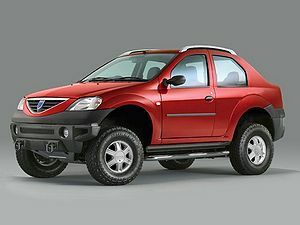 The cheapest car ever and the gayest, the Logan produced by Dacia in a huge plant located in Pitesti, Romania designed by the well-known French automotive, lady car producer Renault. The Logan comes in 3 versions: the Compensator, the Sublimator, and the popular Extension ranges. Its engine is a 6-liter V12, similar to the ones used by NASA spaceships. It has a 6-speed automatic gearbox (5 backwards and 1 sideways), thus being able to attain a speed of "a bit slower". It is also available with a warp speed module (up to warp ten), (warp 1 = speed of light), but is limited with a DOS issue (Denial of Service - aka: faiing to bring your Logan to the main dealer for repair every 5km). The car comes painted in 3 colours (red, yellow and blue, like Romania's flag) by crazy fun of DINAMO, "Vasile Toncu" . Sometimes referred to as "the Hungarian Maybach", the Logan is to be produced in new plants located in Russia, Irak and Afghanistan by well-known, high-tech, reliable and employee-friendly producers. The Logan's estimated price is unknown, and so far has been kept confidential by the company's officials. Not even the buyers know how much they spent for this piece of art. The Logan provides a level of safety which can not be compared to any other vehicle on the market. In its basic version, it has 12 seatbelts, 40 airbags and 2 ejection seats. The body is made of carbon nanotubes, the car being virtually indestructible. The "active safety" features incude two M61 Vulcan cannons and a full complement of ground-to-ground and ground-to-air missiles, very useful in a traffic jam or simply when driving your kids to school. This car wasn't, and will never be sold in high numbers, because that would be detrimental to the marketing acceptance of such a exclusive product. So, if you want to buy a Logan, you'd better stick to your pizza-delivery moped, or buy a less exclusive, but better performing Morris Minor It is just in its early months of sale but already millions of requests have been placed, tens of tests have been passed, thousands of testimonials have been sent in ... it is such a shame this car is not produced in larger numbers. Now in all stores, it is just for decorational purposes, because the car's exhaust provides a 1.5 meter tail of smoke, very useful for coloring walls and suffocating other people (2 in 1!!!). They say that in order to park a Logan backwards, you must first get the refrigerator out of the trunk. This theory, however, was never put to the test, since Logan drivers can't park backwards. Are you nut's?It's a traditional car not for fun!Jesus! After just a few months from its release, the Logan has distinguished itself as one of the most reliable and secure vehicles in the luxury class. It has proven itself more stable than a Jaguar F1 car and marginally more economical to run. Regarding speed (speed of fuel consumption) it is considered a worthy rival for the Bugatti Veyron. The comfort level in this car is simply amazing. All owners have sent in testimonials praising the fine leather seats, wood and titanium insertions, quad zone climatronic, adjustable pneumatic suspension. As far as safety is concerned we are amazed to say that there are no accidents reported to have involved such a vehicle. One other aspect that has earned Logan international respect is its fiability. So far the only reasons for visiting service stations has been scheduled revision and checks. It is this that caused the sudden drop in prices for Logan parts. Ultima editare a paginii a fost efectuată la 2 august 2011, ora 00:44.